Truth? Adventure is not my gig. I’m the luxury guy. On a perfectly fabulous day, I’d rather spend hours poolside in a cabana sipping frosty cold cocktails, with intermittent visits to a spa, than hike to a waterfall. True story. For me, the up close and personal beauty of nature is most often best viewed through the lens of National Geographic or Bear Grylls. And yet, I am commonly called upon to detour from those activities to which I am naturally inclined in order to truly experience the heart and soul of a destination. It’s part of the job (and for the record, I’m not complaining because I am well aware that exploring the world and sharing my insights about it isn’t exactly the most taxing of professions). Lately, my more exotic excursions have taken place at the side of YouTuber Davey Wavey, my great friend and travel compatriot, who unfortunately, not only fails to share my affection for the luxe life, but insists on drawing me out of it. Here again, I would complain but the reality is that, difficult as it is to admit, I always walk away from my adventures with Davey having done some memorable, perspective-shifting thing that I would otherwise never have done left to my own devices. And that can’t be a bad thing, right? 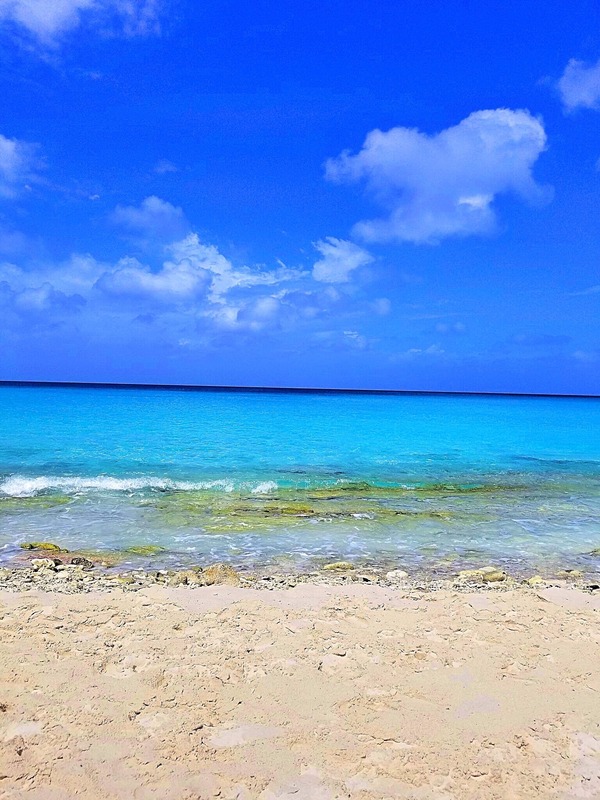 Cool blue waters are a highlight of the beaches of Curaçao. 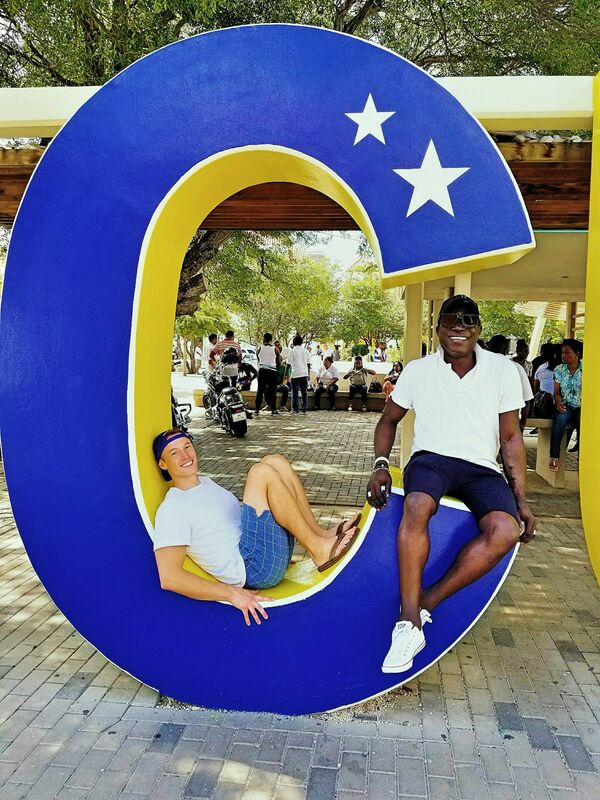 Take for example our most recent visit to Curaçao, the splendidly sunny and diverse Eden that along with Aruba and Bonnaire comprise the Dutch Caribbean trifecta known as the ABC Islands. Now, in the past, I have visited many Caribbean hotspots from Turks & Caicos and the Bahamas to St. John and St. Bart, always with an eye toward escape and doing as little as possible. However, such was not to be the case on this trip. Quelle surprise! 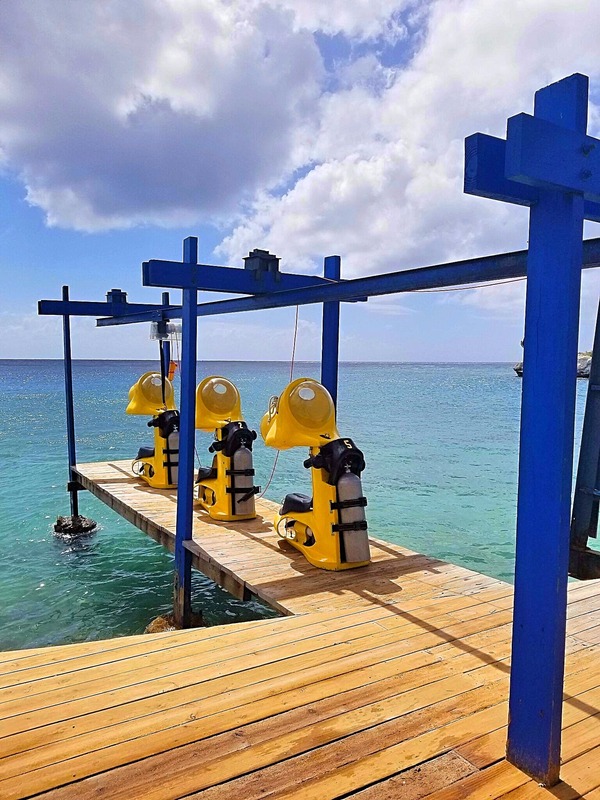 Rather than kicking back for a few days, Davey had, in tandem with the Curaçao Tourism Board, arranged for us to partake in an Amazing Race-like escapade that would carry us to just about every corner of the island’s 171 square miles. Did I mention that I have issues with adventure? The escapade began sedately enough with check-in at the Floris Suite Hotel, a tropical adults-only, all-suite resort of the billowing white curtains and plush white sofa variety that would be just as at home on South Beach or in the Florida Keys. With beyond spacious accommodations, a private beach club called Moomba, a spa and ample poolside cabanas, I began to get a very good feeling about this trip. Spazio Premium Suite. Floris Suite Hotel, Willemstad, Curaçao. However, when I was later introduced to the Floris Hotel’s Ocean Front Spazio Suite (in which I was not accommodated for the record) my spirits soared even higher. The 650-sq. 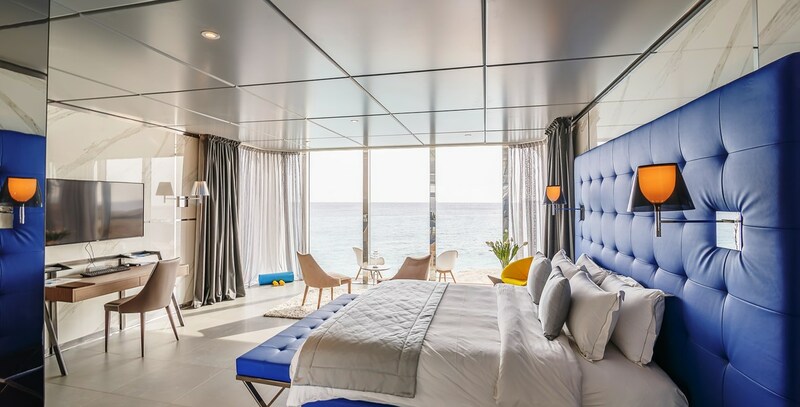 ft. modular, luxury designer suite with its own private beach looking out over the Caribbean Sea and high-end amenities including butler service and upscale Italian designed furniture spoke fervently to me. I wanted to stay. But, alas there was no time for dithering. There was a race to be run. 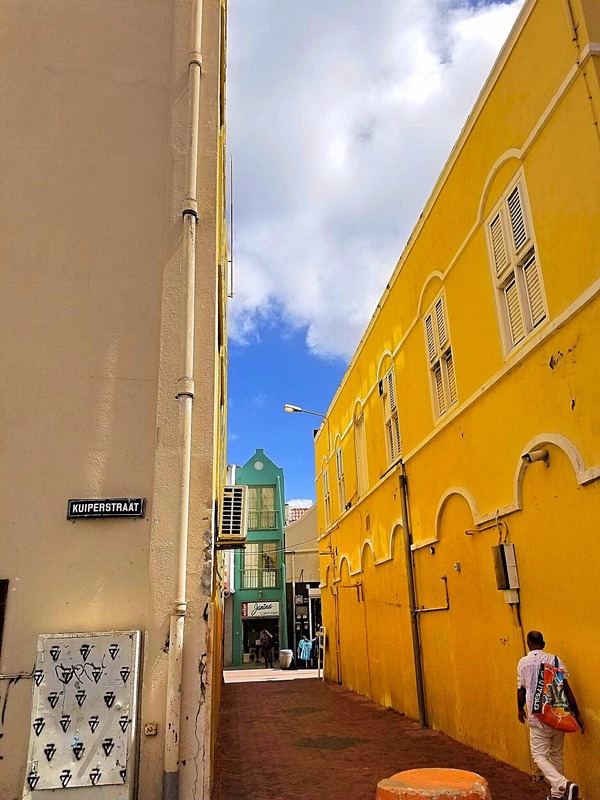 The first leg of our journey into the unknown kicked off approximately 10 minutes away from the hotel in Willemstad, the island’s capital city and thriving heartbeat. As we descended into the epicenter of activity on the colorful and vibrant island, the uniqueness of Curaçao relative to its neighbors immediately struck me – as did the famous breezes for which the isle is known. Sampling the local fare at Kome. Willemstad, Curaçao. Kome, a popular restaurant packed with a mix of locals and tourists in the trendy Pietermaai district, was where we would get our first challenge but not before sampling the eatery’s largely locally sourced, island-inspired menu and getting an introduction to the island from a few well-informed locals. Again, this didn’t seem like such a bad start to things. That is, of course, until our hosts turned the conversation to the next day’s challenges. Why oh why couldn’t I just sleep in? There was a perfectly lovely suite with a terrace and all the fruity cocktails I could consume awaiting me but here I was being forced to do things. Our first challenge called upon us to locate Willemstad’s famous Floating Market, track down a Venezuelan banana and sample it, while our second required us to partake in a local delicacy — a whole fish fried from gills to tail. Okay, it’s just food. I can probably do this, I thought to myself. Skipping a nightcap at Luke’s, another trendy Pietermaai favorite, we turned in early to prep for the day that lay ahead. The next morning, I was up bright and early ready to take on the first challenge. I mean…that is to say…I would be ready after tucking into a spot of breakfast, of course. After all, one needs nutritional fortification for adventure and ours came via a sampling of arepas stuffed with chicken and crab salad, omelets and smoothies at the friendly and inviting Willemstad-based Chilean bistro with the French name known as La Boheme. Exploring the colors of Curaçao with Davey Wavey. Hunger sated and armed with the help of a guide (nothing about the rules precluded us from obtaining assistance), we wandered around the colorful buildings of the UNESCO World Heritage site that is Willemstad taking in the town for the first time in daylight. Along the way, we explored the brightly hued Governor’s Mansion as well as the iconic Queen Emma Bridge, a pontoon bridge designed to swing its entire length parallel to the shore (a feat that makes it more than merely functional in terms of the fact that it connects the Punda and Otrobanda sides of Willemstad, but also a must-see attraction for tourists). With little actual assistance we finally stumbled upon the Floating Market, which would be pretty difficult to miss given its location in the heart of the city. That said, the name of this popular destination is a bit of a misnomer because the market itself does not float. Instead colorful boats filled with fruits, vegetables and seafood dock in the center of town, set up stalls and offer the bounty of Venezuela, Columbia and other nearby locales to residents of Curaçao and tourists alike. Among this panoply of vendors, it didn’t take long for us to find and sample a “Venezuelan banana” which is essentially what we know as a plantain and a proper staple consumed with nearly every meal served on the island. Who knew? Challenge 1 of 5 complete. A bit more meandering around town and then it was off to our next stop, Saltwater Rif Terrace, for the whole fried fish challenge. Essentially, Salt Water is an open-air, waterside shack serving freshly caught seafood alongside regional favorites. I was immediately so taken by the clearly local and totally unpretentious vibe of this off the beaten path spot, that my initial anxiety about the challenge faded. Then out came the fish and it wasn’t nearly as imposing as expected. It was a completely manageable size. I’d dare say it was almost cute until I recalled we were expected to eat the whole thing, including the tongue, which is apparently quite revered for its flavor by Curaçaoans. I took the lead here and ate the tongue, attacking the head with fervor, while Davey tucked into the body. We finished the fish and with it the second challenge. And you know what? I loved it. Not only did I enjoy the crispy, salty fried fish and Salt Water’s freshly made hot sauce (a revelation in and of itself), but I loved the place and the experience. But for the race, I might have missed this hidden gem. Thankfully I didn’t as it was one of the highlights of our visit. After lunch, and to my surprise, there was another surprise. Yet another challenge. Who’s ready for an Aquafari adventure? I suspected the challenges would escalate and it was at this moment they did. Our next trial would involve an underwater excursion called Aquafari and, judging from the name alone, I was pretty sure this might be the challenge that would break me. Despite my apprehension, a few shaky moments and a general lack of understanding about the technology behind the adventure, I found Aquafari to be quite fun. It’s basically like scuba diving or snorkeling on an underwater motor scooter. Best of all, from my perspective, aside from swimming out to the scooter, there wasn’t really much physical exertion involved making it my favorite kind of adventure. With the Aquafari teammates as guides, all we had to do was rev our engines, steer through the cool depths of the Caribbean Sea, marvel at the schools of crayon-colored tropical fish, the colorful coral reef, and other residents of the crystal clear deep-sea underworld and basically enjoy the ride. Easy. As the journey came to an end, I reflected that the experience was one for the bucket list. I had always wanted to go scuba diving, but had no desire to go through the training. This was probably as close as I would ever get and I was good with that. I was also happy that Challenge 3 was completed. Unsurprisingly, our next challenge involved yet another beach. It’s interesting to note here that Curaçao is not blessed with long stretches of white sandy beaches like some of the other ABC islands. It is however blessed with these extraordinary coves and smaller beaches with the clearest waters lapping their shores. They feel like a well-kept secret and that is their charm. One such beach is Playa Knip on the west side of the island, which was where our next challenge was to take place. Somewhere on the beach, there was a bracelet that we were charged with finding. Sounds simple enough but though Playa Knip isn’t exactly expansive, it isn’t exactly small either. As we searched the beach, taking breathers to enjoy the environs, I just couldn’t stop looking out at the sea. 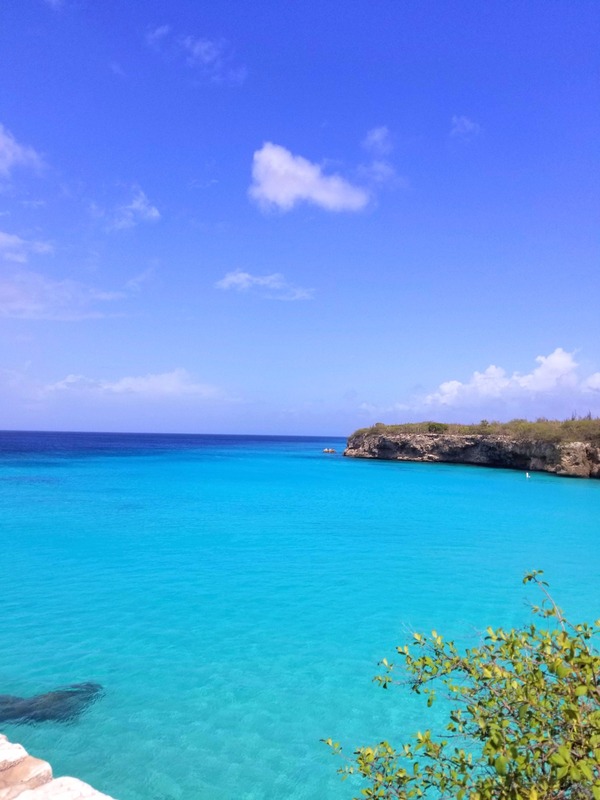 No matter how many times I see the turquoise-colored waters of the Caribbean, I can’t help but be a little in awe and those surrounding Curaçao are among the most spectacular I have seen. Thankfully, my daydreaming and distraction proved useful because as I stared out at the waves, I spotted what looked to be a bracelet in a cove just off the beach. As Davey is the better swimmer among us, he swam out to the rocks in the cove and to both our great delight, my eyesight hadn’t failed me – there was indeed a bracelet in that cove. Crushed it! Another challenge done and dusted. While visiting that side of the island, we stopped in for lunch at the Cactus Café in Christoffel National Park, where another quirky aspect of Curaçao’s topography was revealed – cacti. On the west side of the island, cacti is ubiquitous and the dry, dusty landscape is more reminiscent of the desert than a tropical island. It was very similar to the kind of dichotomy in terms of geography that you might see in the Canary Islands. But, I digress. There was still another beach to explore and a final challenge to be completed. Enjoying the view on one of Curaçao’s private beaches. Our final stop was Playa Piskado, where we were to engage in a SeaBob Excursion. Now the SeaBob is billed as a jet powered personal submarine. No disrespect, but when I think of submarines, I think of an enclosed underwater vehicle and this was anything but. Despite a concerted effort – that included promises of mind-blowing sightings of sea turtles and more of those awesome colorful schools of fish – I could not be convinced to change my mind about engaging in this particular activity. Davey was on his own for this one. So, while he explored the depths of the sea in his personal submarine, I enjoyed the views of Playa Piskado…from the air-conditioned confines of our transport. In the final analysis, however, my resistance to the submarine outing didn’t matter much because Davey loved it, we still got our bracelet for the challenge and I got a nap. Everyone was happy. I call that winning. 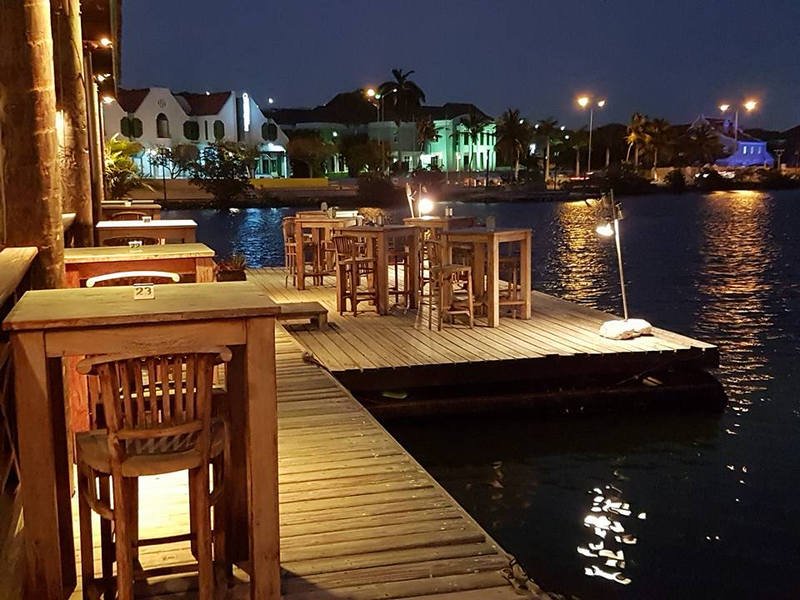 To celebrate completing the race and all five of its associated challenges, we booked in for dinner at Oporto, a swank steak and seafood house located in one of the trendiest venues in Curaçao. 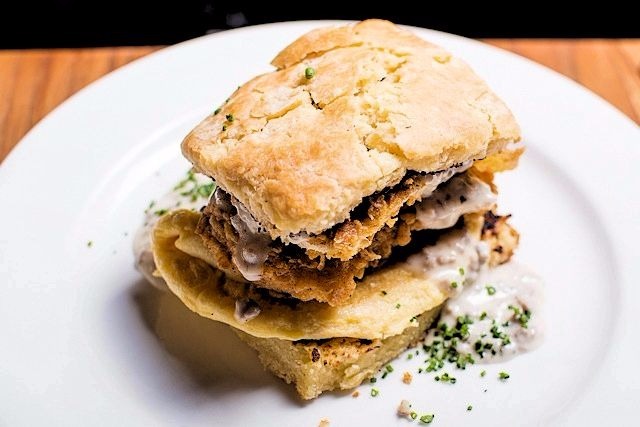 At this point, by my estimation, we certainly deserved a little pampering after all that activity and that is precisely what we got at this upscale boite. Perched at the apex of fine-dining on the island, Oporto specializes in a continental menu that includes oodles of tantalizing options ranging from Red Snapper Fillet a la Meuniere and Seafood Stew to Queen Rack of Lamb and Fillet Mignon Tournedos. It was the perfect place to wind down with a glass of wine or three after a few very busy (and very fun) days. At this point, the only thing missing was our prize. 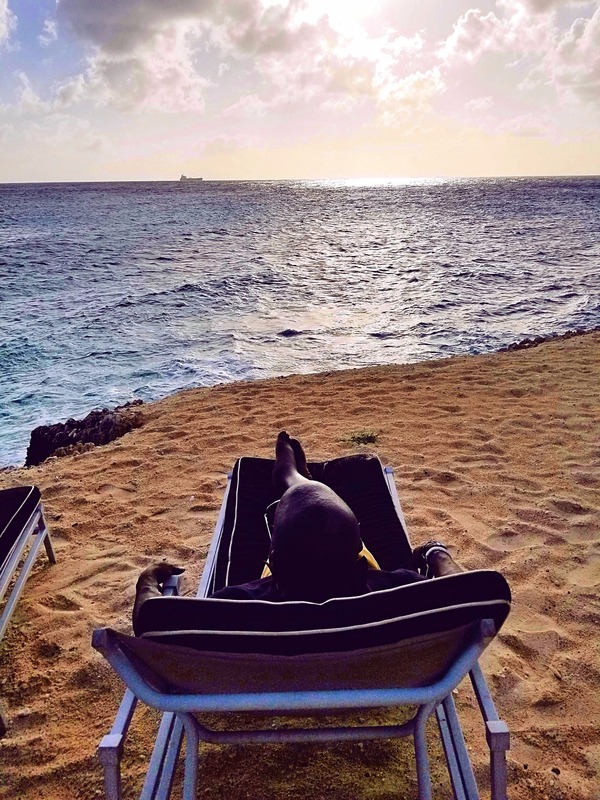 What exactly had our mad dash exploits across Curaçao earned us? The next morning, we awoke to just that. We both received massages in the spa at the Floris Hotel, and they were heaven. All’s well that ends well, as they say. Listen, I’m still not the adventure guy and I probably never will be. But getting in touch with my inner Bear Grylls in Curaçao helped me to discover a side of the island that I wouldn’t normally see while holed up inside a resort and it gave me a whole different perspective to share. And I still managed to squeeze in a fair amount of pampering. How fab is that? So if you, like me, find yourself wary of adventure on holiday, I say don’t be scared, be inspired my journey. And for inspiring this new inflection point in my travels, I say ‘Hoorah for Curaçao’.  For more information about Curaçao, click here.